8 posts categorized "Wine Country"
I hate it when October rolls around, and I haven't made it to a single Harvest party. So, I thought you all might like a round-up of all the harvest events & parties we're considering. Many of these events sell out, so I encourage you to make your reservations if you want to attend. It's been a few years since I last ate at Tra Vigne in St. Helena. The first time I ate there, maybe 6 or so years ago, it was very, very good. I returned with excitement 2 or 3 years later, and found it lackluster at best. My experience was echoed on food sites across the web. Sadly, the consensus was that Michael Chiarello had just spread himself too thin with his many ventures. At any rate, I was in no hurry to return. 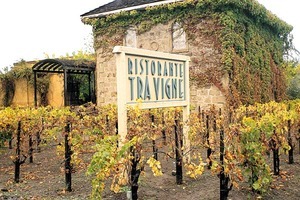 But yesterday, after a private barrel tasting at Sullivan Vineyards (watch this space next Sunday for more on that), my companions and I were famished and a mere mile away from Tra Vigne. Should we risk it? We agreed that we weren't in the mood for sandwiches from Dean & Deluca, and were too hungry to properly research any new places, so off we went to Tra Vigne (which, incidentally, is no longer an M. Chiarello restaurant). As we perused the menu, a plate of chewy white bread was brought to our table along with a dish of warm olives and caper berries in beautiful peridot-colored olive oil. In true food-lover form, we decided to order several smaller dishes and half-orders and share amongst the table. So, today was apparently the "day for many food & wine events". Alder at Vinography raves about SF FallFest 2004, while Sam of Becks & Posh and Pim of Chez Pim both attended the Chowing with the Hounds 2004 picnic. 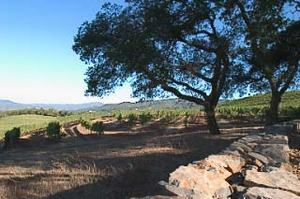 For our part, we drove up to Sonoma with our friends K & O for Cline's Annual Harvest Party. We've been Pendulum Club members with Cline for four years now, but this is the first Harvest Party we've been to! Free for members, and $25 for guests, this was a really wonderful way to spend the day. There was a ton of tasty food (and yes, I avoided all the pasta, bread and potato salads) - there was a duck sausage that was amazing - including an apple pie (which, again, I refrained from) which everyone said was amazing. I did sneak a quarter-sized piece of the crumble on top, which was AWESOME. Our friends CG and JS invited us this weekend to join CGs family in a grape pick in Sonoma. Now, picking grapes is hard, honest labor. Yet, it's not at all the same as, say, picking cotton. First of all, the setting is gorgeous. Second, picking grapes for wine that you will someday have the opportunity to taste is one of those fairy tales that people in OTHER parts of the country only get to read about. 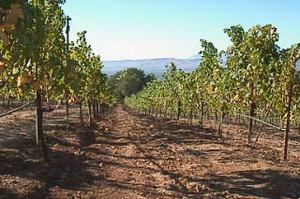 So we got out to this gorgeous vineyard about 3.5 miles outside of Sonoma town square, and got started. The vines here are all Bordeaux varietals - Cab Sauvingon, Cab Franc & Merlot - and we were out around 500lbs of the second growths. We made great headway in the morning, and after a nice break for lunch, wrapped up around 2:30. Mr. & Mrs. G were hosting the "pickers" for dinner that evening, so we headed out to their absolutely beautiful home in Santa Rosa, where the 500lbs of grapes were destemmed & crushed (and, in case you wondered, yellowjackets love grapes!). Once C and I were showered and cleaned up a bit, Mr. G gave us a tour of his absolutely amazing family wine production. A few dozen gallons of the above grapes, along with Sauv Blanc, Viognier & even Gewurtzraminer. After the lesson in vinification (which, no joke, I aspire to be able to do someday, if only to cover my property tax costs), we headed back upstairs to relax for a bit. Mrs. G fed us soooo well with a wonderful baked ziti, garlic eggplant (Mrs. G - I'd love that recipe if you're so obliged) & salad, plus a delicious lemon pie. Mr. G complemented these with his delicious Gewurtz to start, followed up by the 2002 Cab Franc and 2001 Cab Sauvignon. Many, many thanks to Mr. & Mrs G and family for an absolutely wonderful day, and phenomenal company. Count us in next year for the grape pick weekend - we can't imagine a better way to spend the day! My friend Karen was in town from LA, and had never been to Sonoma, so off we went. 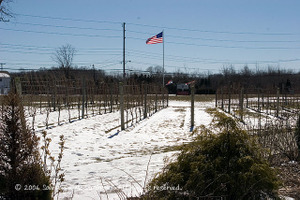 Started off at Gundlach-Budschu (www.gunbun.com), which is one of my favorite wineries. Sadly, the tasting room folks all recognize me now (partially, I suppose, on account of the fact that one of them worked with my mother in the ladies' lingerie business for YEARS), so we got taken care of really well. We each ended up with 3 bottles from them (I got a Gewurtzraminer, a Morse Zinfandel & a Bearitage - which I ended up sending home to K. She got the Gewurz, the Bear and a Tempranillo). Next up, Ravenswood. C & I just got a membership here - who knew Ravenswood was more than the $9 bottle of "Vintner's Blend" Zinfandel on the grocery store shelf?? They bottle 15 (!!!) different Zinfandels, most of which are only available at the winery. Since we had just gotten our membership, our first purchase was 35% off, so I kind of went overboard... C really, really loves their Dickerson Zin, so I got a half-case of the '02, and 2 bottles of the '01 - thought it would be fun to do a tasting over dinner one night. Also got 2 bottles of the Cooke, which is literally a couple hundred cases a year production. It's really fabulous wine. I highly recommend thier Zinfomania club if you are a Zin lover. Ended up getting sandwiches at the Cucina Viansa in the town square, and sat at Sebastiani to eat. Now, I normally would NEVER go to Seb. on account of how tourist-trappy it is, but the guy at R'wood told us that they were getting rid of all their crap wines and focusing on their premiums. 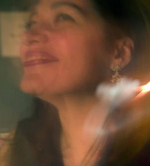 Still, I didn't really care for anything there - the wine just seemed... unfocused. And the prices didn't seem in line with the quality. Karen, however, is a fan of Italian varietals, so she ended up with a couple of bottles... but I can't remember what they were. On to Valley of the Moon, which at one time was one of my favorite wineries. Their bottles are so beautiful, I had to show Karen. Plus, she's a Sangiovese lover, and they have a pretty good one. Unfortunately, they were SO snotty... you would have thought you were in Napa. Karen picked up one Sangiovese, but we got out of there pretty fast. 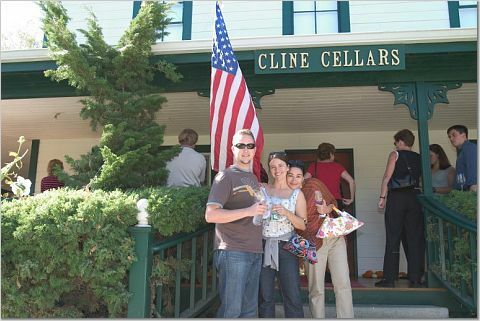 We finished off at Cline, my absolute FAVORITE winery. We spent about 30 minutes there - I think K was "wined-out", but I picked up a mixed half-case (what else is new?). She got a bottle of Cashmere, and called it a day. We came back to our house so she could meet C, and we grilled some Aidells Cuban-style sausages, corn & peppers up on the rooftop and cracked open a bottle of the Cooke. Yum. What a lovely way to spend a day!